Bellopede was a sweeper or centre back who played almost his entire career for Sorrento from 1974 to 1981 and Messina from 1982 to 1987 becoming a legend of the Sicilian team with which he played 178 matches. He also played for Savoia, Arezzo, Voghera and Pro Vercelli. 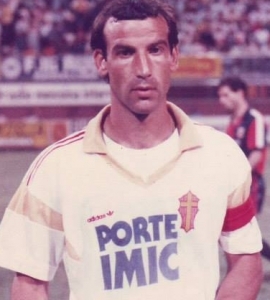 The defender was the captain who brought Messina back to Serie B in 1985-86. His dream was playing in Serie A but in the only season he played in Serie B with Messina, the club didn't gain the promotion and he decided to leave. He had the chance to play with a young Salvatore Schillaci and he even used to "bully" Totò especially during a tough match: the attacker received a yellow card due to a bad faul that he did again after a few minutes so Bellopede slapped him a bit to calm him down. Bellopede was the typical sweeper, implacable behind the defence and always ready to tackle to take the ball from his opponents or hit their ankles depending on the situation. He also had vision and technique which were way superior to the Serie C level: he often went out his team's area with the ball on his feet and the head held high to give accurate passes. In the rare occasions he scored a goal he never did it by chance like the one against Monopoli in 1986 when he raised the ball with the right heel before shooting with the same foot. In the same match he also gave Schillaci an assist crossing from the goalflick near the left corner flag. His shirt number was 6, the same as Scirea and Baresi.